Some of the top names in the e-reader market are asking the Federal Communications Commission (FCC) to waive the accessibility requirements for their devices. Amazon, Sony, and Kobo have all petitioned the FCC to waive the accessibility requirement for their e-readers. They do not want to have to make their devices "accessible to and usable by individuals with disabilities." "Rendering ACS accessible on e-readers would require fundamentally altering the devices and it may not be possible to meet that requirement and maintain e-readers as inexpensive mobile reading devices, and yet the necessary changes, if they were made, would not yield a meaningful benefit to individuals with disabilities. It�s not merely cost but the very nature of a specialized e-reader device that is at issue." Disabilities rights advocates content that because e-readers are not only being used for leisure, but also education the devices should be required to be accessible. Furthermore, Amazon has over a 100 million Kindle-exclusive titles according to the Wall Street Journal. If Kindles are not usable by the blind and people with other disabilities such as dyslexia they are shut out from this content. It is questionable if adding accessibility features will really slow down and bulk up e-readers as the companies claim. A more realistic possibility is that the companies see adding accessibility features as an unwanted cost and challenge. Instead of requesting waivers from the government these e-reader companies should focus on making devices that are usable to the masses. Adding accessibility feature to devices is important and benefits the consumer as well as the company. With accessibility features e-readers can be purchased in public school, there are more potential customers, and the public will view the company in a better light. The FCC is requesting the public's input in this matter through Tuesday, September 3. People interested in making a comment can do so by clicking here. The full petition can be read here. Update: Amazon's newest Kindle Fire HD and Kindle Fire HDX include new accessibility features. Click here to learn more about the new accessibility features. 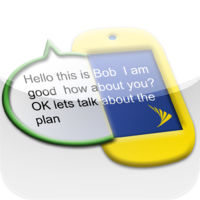 "Wireless CapTel(R) by Sprint(R) is a free app available for individuals with hearing loss and understandable speech to place calls CapTel services on iOS. Using state of the art voice recognition technology, CapTel delivers captions of everything your caller says, while you listen (with your residual hearing) and speak directly to your caller." The Wireless CapTel service is free for Sprint users with the Everything Data Plan. In addition to the iPhone Wireless CapTel is compatible with select Android smartphones from Sprint. To uses the service Sprint customers must download the app on the App Store. Click here to learn more about Wireless CapTel from Sprint. The Celluon Epic is a Bluetooth laser keyboard. The compact device projects a QWERTY keyboard onto most flat surfaces. (Glass tabletops being the exception) You can connect the Epic to vertically any device that supports Bluetooth keyboards including devices running iOS, Android, Windows Phone, and Blackberry 10. On the back of the device there is a charging port and pairing button. Once you have the Epic paired with your device it acts the same as any other keyboard. For any keyboard the most important consideration is the typing experience that it provides. The virtual keyboard brightness is adjustable and is easy to see in most lighting conditions. Unfortunately the brightness does not automatically adjust based on ambient light. With each keystroke a beeping sound is played which can be turned down. The typing experience on the Epic is mediocre at best. Inadvertently activating the wrong key can make typing frustrating and tiring. Even if you are a touch typist you'll still need to look down on the laser keyboard as you type. The Epic is definitely not for the blind or visually impaired. Compared to a conventional keyboard the Epic doesn't hold its own, but if you look as the Epic as a supplement to your on screen keyboard the Epic looks more promising. If you have trouble typing on your smartphone or tablet the compact Epic may be perfect for you. You can easily bring the Epic along in your pocket and then use it when you need to type a longer email or text. The Epic is available directly from Celluon for $169.99 and through Amazon for a special price of $149.99. Click read more to view more photos of the Celluon Epic. Recently Bookshare's downloadable library of accessible ebooks reached 200,000 titles. The 200,000 mark comes just months after the 11th anniversary of the service. Bookshare books contain digital text and can be read with text-to-speech and synchronized highlighting. Text-to-speech paired with synchronized highlighting can help dyslexics with comprehension. Members can also read books on a refreshable braille display. As a result of funding from the United States Department of Education Office of Special Education Programs (OSEP) Bookshare is able to provide its services free to qualified U.S. students. For information on membership click here. Members are provided with software to read Bookshare books on their Mac or PC but Bookshare books can also be read on many other devices including iOS devices using the Read2Go or Voice Dream Reader app. An Android app called Go Read is also available. The next version of Android appears among the specs for Google's stock version of the HTC One. Android 4.3 appears to be playing a game of "Where's Waldo?," seemingly popping up in one upcoming smartphone after another. The latest sighting comes courtesy of the Bluetooth SIG, which uncovered an application for Google's version of the HTC One that listed Android 4.3 as the operating system. Revealing Bluetooth certification for the phone, the application was submitted on June 18 and approved on July 5. The design name PN071xx_Android 4.3_G specifically refers to the HTC One and the operating system version, while the G likely stands for Google. The request for Bluetooth certification on an existing phone may have been necessary since Android 4.3 will include Bluetooth 4.0 LE, according to PhoneArena. The new LE, or low-energy, flavor of Bluetooth 4.0 will support a greater array of devices, including fitness and health monitors. It also promises to be easier to set up and manage than the current version of Bluetooth. Android 4.3 has also reportedly been spied on other phones in the wild, including the Google Play Galaxy S4 and the Nexus 4. Brandished on stage at Microsoft's Build conference last week by Steve Ballmer himself as the next great thing in Windows 8 tablet hardware, Acer's Iconia W3 is the first 8-in tablet with the ability to run the full version of the company's latest OS, rather than falling back on the ARM-based Windows RT. This theoretically crams all the advantages of a desktop PC into a compact tablet, and in fairness to the W3, a fair amount of those benefits do shine through. On the other hand, while �279 seems a bargain for a small, yet fully functional Windows 8 tablet, users will more or less get what they pay for in terms of the realistic usability of such a scaled-down Windows 8 experience. To get the specs out of the way, the W3 sports an 8-in WXGA multi-touch LCD screen, powered by Intel's Atom Z2769 processor, and runs the 32-bit edition of Windows 8. It has 2GB of RAM onboard, with 64GB of storage space, and fore and aft cameras for video conferencing and photography. As specs go, these are fairly respectable for the money, even if the overall build quality of the tablet's shell suffers from Acer's customary cheap and cheerful approach. But compared to, say, Google's heavily-subsidised Nexus 7, this is a significantly more powerful offering, especially when you factor in the Windows 8 licence cost. However, with the stock Windows 8 installation (bear in mind we also installed the Windows 8.1 preview build as well) taking up 49GB of the drive, this leaves only 32.1GB left for your own data. The W3's Micro SD slot supports a further 32GB external storage too, though. Drive space will probably be of little concern in the long run, anyway, because this tablet feels unlikely to become anybody's workhorse �road warrior' device. Bluntly, the W3 is just too small for any serious Windows 8 use. With a choice of only two screen resolutions - native 1280 x 800 and the OS's minimum supported 1024 x 768 - trying to use the Windows 8 desktop mode quickly becomes a bind on a visual and interactive level. Such a high resolution on such a small device makes touchscreen use a hit and miss affair, not to mention successfully reading any icon or taskbar labels in desktop mode. While increasing font sizes helps, picking out options on the taskbar or even successfully tapping icons can be taxing, and you'll often find yourself giving up and quitting back to the Modern UI, queuing up your most-used apps as Charms on there. That's probably the way Microsoft wants it anyway, of course. There's no native stylus support either, so while Surface Pro's big, clear screen also enjoys pinpoint Wacom accuracy, the W3 is all-too reliant on fingertips that are just too big and clumsy. While using most Modern apps and general web browsing is straightforward, enterprise users will find the pokiness of the desktop mode a real disadvantage. We don�t know about you, but we often miss important messages or SMS texts coming in to our mobile phone because we�re working on the computer in another room, or the phone is buried in a pocket or bag and we don�t hear the alert chime. Now if only there was a way to link the PC and the phone together we could avoid the problem and stay updated constantly. DeskNotifier is a cool little app and computer freeware program which connects your phone and PC together, either over USB or via WiFi, so you will always receive notifications and messages even if you�re working on the computer away from the handset. To set it all up, you simply download the PC Windows software and install it, and then install a small free app on your phone. You can set the system to connect only via USB cable, or do as we did and select WiFi as your connection method, which makes things much easier. Once the computer and the phone are connected via the phone�s IP number on your network (easy to do via the menus) you�re good to go. From then on, every time your phone receives a message or notification, it will automatically be sent to your desktop via a task bar popup. The really cool thing is you can respond instantly to the SMS by clicking on the pop up and entering in the return message, which means you don�t have to touch your phone to carry on a text conversation. You can also initiate new SMS conversations using the PC as well. Very neat. The software can cope with call notifications, SMS messages, WhatsApp, Viber, Facebook and other incoming notifications, in fact most 3rd party apps. There are two versions, the free one and a $0.99c Pro version, which offers more functionality such as notification filters, password protection and file transfer between phone and PC. The software is well written and works as promised, although it is a little disconcerting to stumble across German menu text from time to time, where the developers have not finished translating properly. We would also like the ability to store and recall past alerts and conversations, because at the moment the notifications disappear after a while and you can�t retrieve them on the computer or store them for later action. Nevertheless, despite these niggles, we�re really enjoying the new functionality, and will definitely keep this puppy installed for the duration. Definitely worth checking out!